Dental care is a must for your pet! Regular dental cleanings and frequent brushing do more than just keep your pet's teeth clean and stop "doggy breath" - proper dental care prevents the development of periodontal disease, a condition that can permanently damage your pet's teeth. If left untreated, bacteria resulting from periodontal disease can circulate through your pet's bloodstream, causing damage to the heart, liver and other internal organs. Crossroads Animal Clinic performs a full range of veterinary dental procedures, including complete dental cleanings, dental x-rays and necessary dental extractions. 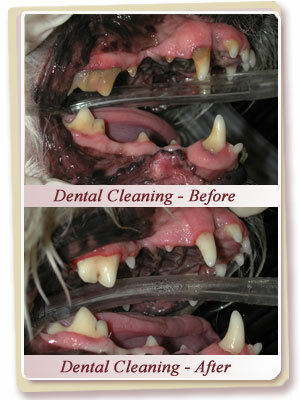 Your pet's dental cleaning is very different from the same procedure you undergo at the dentist each year. Anesthesia is required to keep your pet still and comfortable during the procedure. Because of this, we perform a pre-anesthetic screening on all pets prior to the dental cleaning; this allows us to detect any complications that may arise from the use of anesthesia and create an anesthetic protocol that's specific to your pet. During the dental cleaning, a hand scaler is used to remove tartar and plaque from your pet's teeth. Next, a periodontal probe checks for pockets under the gumline where periodontal disease might hide. An ultrasonic scaler is then used to clean the teeth above the gumline, and a curette is used to clean the teeth below the gumline. Your pet's teeth are then polished - this creates a smooth surface that helps prevent further tartar build-up. Then your pet's teeth are washed with a fluoride treatment to clean out any debris from the cleaning and prevent future tartar buildup. 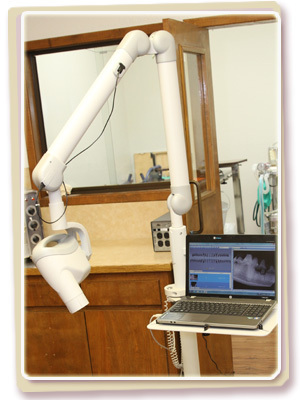 Dental x-rays are performed to determine the condition of your pet's teeth under the gumline. When it is determined a tooth needs extracting, the doctor will use a local block and dental flaps if necessary. We encourage you to continue your pet's dental care at home. 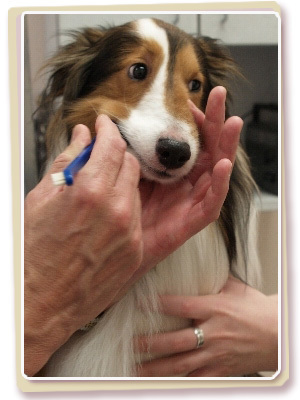 Our staff can show you how to brush your pet's teeth. In addition, we can recommend treats and other products that promote good dental health. Crossroads Animal Clinic is pleased to offer non-anesthetic dental services for our valued patients and clients. This is a safe and effective tool for the overall health of your pet. We have partnered with Animal Dental Care (ADC) to provide this service. In the last 10 years, ADC has established an excellent reputation among a growing network of veterinary practices due to its professionalism and gentle, compassionate way with animals. Non-anesthetic dental care is not a replacement for traditional, anesthetized dental procedures, but it functions as an excellent supplement to your pet's dental program. The procedure can also serve as an appropriate alternative in certain medical scenarios, such as when pets may be too young to need a full anesthetic dental procedure or if your pet is prevented from undergoing general anesthesia. This service also allows some patients, when appropriate, to go on a 3-4 month maintenance schedule. Like any medical procedure, non-anesthetic prophylaxes carry risks as well as benefits. When performed correctly, however, the benefits of non-anesthetic dentistry outweigh the risks. All prophylaxes are monitored by one of our licensed veterinarians here at Crossroads and all ADC hygienists are experienced veterinary technicians that have undergone rigorous training and supervision to ensure their experience and expertise in this technique. We require every patient to have a full medical and behavioral history form completed prior to each appointment. ADC will review your pet's Crossroads charts and talk with doctors and staff to learn your pet's complete medical history. This is done in addition to the oral and health examination that was completed by the veterinarian who recommended the procedure. A check of joint discomfort or pain will be done to determine your pet's candidacy. We'll walk your pet to see if there is any obvious discomfort. Next, a complete extra-oral and intra-oral exam is completed. ADC checks for symmetry, swelling and pain. They then evaluate each tooth and surrounding gingival for pathology. At this stage, they evaluate calculus levels, compromised teeth, gingival condition and periodontal pockets. This step determines the candidacy of your pet for the procedure. A treatment plan is created in partnership with an ADC staff member, the doctor, and client. The plan can range from simply completing the non-anesthetic prophylaxis as scheduled or recommending that the procedure be performed under general anesthesia. The treatment plans will include home care instructions and a re-call date for an anesthetic dental treatment or a maintenance POPD (professional outpatient preventive dentistry) procedure, if necessary. This step is crucial in ensuring your pet receives the proper care he or she needs. A POPD begins with the removal of deposits of plaque and calculus. A combination of forceps, hand instruments and power scaling are used for plaque and calculus removal. If your pet is in stages 3 and 4 of periodontal disease, this would be very difficult and is why the pre-exam is so important in determining whether or not your pet is a candidate for this procedure. After the dental procedure is completed, a 6-point probing of each tooth is performed. Any areas of concern are communicated to the doctor and client. All abnormal pocket depths are noted for the final chart. ADC hygienists will then perform a machine polish at the end of every prophylaxis using a pumice or polishing paste. Polishing will assist in the smoothing out of minor defects of the enamel which may have occurred during the procedure, thus aiding in the prevention of future plaque accumulation. It will also help with the removal of certain enamel stains. Any diseased tissue, plaque or paste remnants are removed through an irrigation of the oral cavity. The oral cavity and gingival pockets, or sulcus, are flushed with a chlorhexidine based solution. A complete evaluation of each tooth is performed, checking for any retained calculus with a periodontal probe and/or explorer. The dental chart is completed, and any special circumstances are noted. A completed chart will include proper patient information, abnormal probing depths, periodontal problems, tooth abnormalities, home care recommendations, re-call dates, and any additional notes. The doctor will examine the oral cavity with a corresponding evaluation of the dental chart to ensure complete pathological notation. Next, a post-treatment oral health care plan is prepared for you and your pet. Dental awareness and education is of the utmost importance for the overall well-being of your pet. After each POPD procedure, the hygienist will review the pet's dental experience and chart with you, and explain the many options regarding home care. Q: How can you effectively perform cleaning on a dog or cat while it is squirming around and under stress? A: We sit at eye-level with the pet and use a variety of proprietary holds to maintain control while keeping our patient calm and comfortable. Pets are never forced or bullied. We're very pleased at how compliant dogs and cats become during the procedure. Animal Dental Care is highly skilled in proper dog and cat handling techniques to ensure a safe and calm experience. Q: Are you able to do a thorough cleaning both above and below the gum line? A: The technicians are highly skilled hygienists. They know the importance of removing all of the plaque and calculus from the outside and inside surfaces of the teeth, both above and below the gum line. We understand our scope of practice and work alongside anesthetic dentistry to provide the best possible care. Q: Don't most pets become frightened and panic when you attempt to use a scaler or a motorized polisher? A: We treat our patients much like a dentist treats a young child during a first-time dental visit. We use patience in our approach, and slowly introduce each phase of the procedure. As we build trust, almost every dog and cat we treat will allow us to use all of the exact same tools used in traditional veterinary dentistry. Q: Is this technique effective with high-risk patients? A: Yes. Non-anesthetic dental cleanings are usually a much better alternative for older pets, and for pets with chronic kidney, liver or heart disease who might not be a candidate for general anesthesia. We find our service particularly beneficial for candidates who are at a grade 1 to 2 tartar level, for those pets who are at high risks for anesthesia, and for those pets whose owners refuse the anesthesia all together. Q: Can any dog or cat be a candidate for a non-anesthetic procedure? A: No. While the vast majority of dogs and cats will benefit greatly from a non-anesthetic procedure, there are some for whom it is not appropriate. Examples of poor candidates include pets with: severe gingivitis, caries (decalcification of tooth enamel), fractured teeth or stomatitis. Our non-anesthetic dental (NAD) hygienists are aware of the limitations of our drug-free technique. The discovery of a loose or fractured tooth, gum disease, tumors, epuli, abscess or any other condition necessitates a doctor's intervention. In cases where it is discovered that a NAD is not appropriate, we'll recommend traditional dental methods. Q: What does the technician do if a patient is completely uncooperative? A: The hygienist can usually tell very quickly whether a pet's temperament will allow for a successful procedure. In some cases, they are able to calm fearful pets enough to allow for a full cleaning. In some cases, a light sedative is all that is needed. Other times, the technician will determine that the pet's temperament simply is not conducive to anesthesia-free treatment and they will recommend an alternative treatment approach.